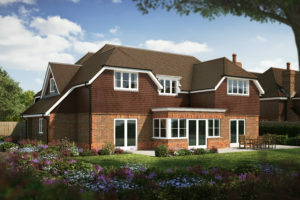 We have two plots remaining at our prestigious development Oakfields School, Pyrford. This exclusive development is built on the site of the former Oakfield School in Coldharbour Road, which inspired its name. It consists of 4 five-bedroom detached houses and 5 two and three-bedroom luxury apartments and is scheduled for completion in early Summer 2016. Situated in the tree-lined Pyrford; a peaceful, quiet and unhurried village perfect for commuters looking to step away from city life and retreat to the countryside. 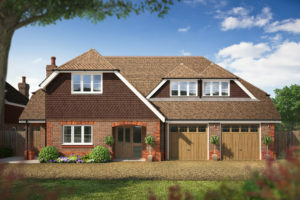 Pyrford is only three miles east of Woking and less than ten miles from Guildford making it an ideal location. Within walking distance of West Byfleet railway station, it is less than an hours commute to Central London and within easy reach of the M25, M3 and A3. Pyrford offers everything you could want or need from peaceful village living with good schools and local shops that sell all the daily essentials. It is surrounded by golf courses including the challenging Pyrford Golf Club with neighbouring West Byfleet’s excellent New Zealand and West Byfleet Golf Clubs. Surrey Hills Area of Outstanding Natural Beauty is also on the doorstep for relaxing walks and beautiful views while RHS Gardens at Wisley is only a short drive away. We have worked closely with the local community to ensure the ‘right’ scheme for the site was produced and have received positive feedback from the community and a great deal of interest from potential purchased prior to any marketing. 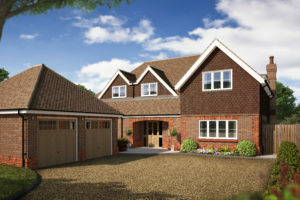 Although plots 2 and 3 have not officially been released, enquiries have now opened due to the demand. Don’t miss this rare opportunity in Pyrford and contact us today at 01252 733885.